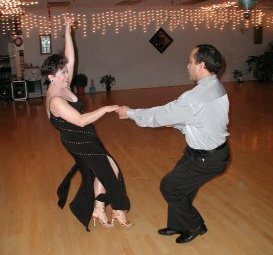 Not sure if ballroom dancing is for you? Almost every Friday evening from 9-11:00 PM we host a dance party for our students and guests. This is an opportunity for our students to practice what they’ve learned in a fun, friendly and supportive environment. Guests are always welcome at our parties; we ask our guests and our students who are not currently enrolled in a program to pay a nominal $5 cover charge. Our students enjoy going to other dance venues where they can practice what they’ve learned and get the experience of dancing with different partners. We usually sponsor a dance outing at least once a month. We often provide demonstrations and shows for various charity and social organizations, as well as for the general public. Studio One is widely known for its theme parties. Come and enjoy our Valentine’s Party, St Patrick’s Day Party, Halloween Masquerade Ball (not to be missed! ), Holiday Party, and End-of-Year Bash. And someone is always having a birthday or anniversary to celebrate. You don’t have to know how to dance to join us. Think of it as a party that happens to include dancing!